We are grateful our planet is home to an abundance of gifts. During your DIY Mala Bracelet Workshop, you'll learn about combining the metaphysical energies of gemstones with the aromatic and healing benefits of essential oils to dynamically support your emotional and physical well being. Gemstones are made up of minute crystals which are in constant motion thus emitting an energy signature or frequency. On a cellular level, our bodies are composed of water and minerals that hold similar crystalline structures. Because of this, we are naturally receptive to the subtle vibrations of gemstones as they transmit, reflect, store and receive light and energy. The gemstone's synergy of light, colour and vibration has the power to soothe your heart, ground your physical being, and protect your energy field. Plants directly harness the light and warmth of the sun, then synthesize and concentrate that energy into the highest vibrational essential oils to support you in radiating your best and brightest self. The basic premise of aromatherapy is to access the lightning fast electro-chemical pathway to your limbic system in your brain, the instinctive centre of your emotional life. Your sense of smell is the most simple, direct and potent route to catalyzing and supporting optimal emotional wellbeing. Setting an intention is a powerful way to heighten awareness while shifting your consciousness and behaviour toward a desired outcome, enhancing your embodied experience. Like setting your life compass to True North, once you connect to your Self or Source, listening to the quietness of your heart or Source connection, an ennobled thought or exalted emotion will emerge into your consciousness that invites you to live authentically with a sense of worthiness and belonging. Here are some examples of powerful intentions. In order to feel deeply connected to our humanity and that which we reverence, we'll take a moment now to pause and turn our attention inward. Become quiet and attune to your Self, your body sensations and your emotional landscape. Listen deeply and allow what's sacred to speak to you. Once you tap your own sense of inner stillness, invite a word or two into your silent awareness that will become your intention as you create and learn together. At this point, to create connection and openness, you may want to go around the room and have participants share their name, feelings and intentions for the workshop. Mala beads have been used by yogis and spiritual seekers for thousands of years to help keep their minds focused during meditation. A mala is simply a string of beads that acts as a tool to help count mantras, and provides a tactile guide while sitting in silence. During our workshop, you'll make a mala diffuser bracelet for the purpose of focusing on your stated intention and enhancing your emotional wellbeing. You will receive all the necessary supplies to make your mala diffuser bracelet: high-quality elastic cord, a selection of 8mm gemstones, plus a spacer to hide the secured knot when you finish your bracelet. First, determine the approximate size of your wrist: S/M or M/L, plus if you prefer your bracelet to be snug or have some slack. SPECIALTY GEMSTONES: The other half of your bracelet will comprised of specialty gemstones, selected specifically for your workshop. Be sure and include a spacer as the last item when stringing your gemstone beads. Your workshop leader will assist you in tying and sealing the knot on your newly created mala diffuser bracelet. The spacer will hide the secured knot of your beautiful creation! 4. WHAT IS EMOTIONAL WELLNESS? According to Biocognitive Science*, wellness implies that you are in harmony with your Self (mind and body) and your culture. These three components of wellness -- mind-body-culture -- are inseparable and constitute the foundation of health. By this logic, one way to perceive stress is: a moment or a pattern of disruption that breaks systemic harmony to any or all of these three components of wellness. Choice is at the root of determining the quality of our lives. We live with internal voices plus cultural pressures to be more, do more, have more, give more. Is now a good time to include more? Or would it be better to let go and cultivate space? What's true for you? Determining your emotional capacity and agility means pacing yourself to feel into the best choice. This is a dynamic choice based on what feels good to you, what resonates with your most cherished values and intentions, and ultimately, what supports harmony for you -- in the moment. Our choices are also influenced by the multiple cycles and rhythms of our lives: seasonal, life stage, internal bio-rhythms, and subtle and constant shifts that are occurring on our planet and throughout the cosmos. Our workshop experience invites you to enhance your emotional capacity and agility to flow with these cycles and rhythms by co-authoring your wellness with the aromatic allies that may support you on your unique journey of healing and growth. Ultimately, you'll resonate with particular scents intuitively. So follow your nose -- and your heart -- to open up to love, abundance, and peace of mind like never before, compliments of these beautiful gifts of the earth. ARE YOU SEEKING: to settle down? / to regain composure? / to chill out? ARE YOU SEEKING: a pick-me-up? / to regain energy and vitality? / a sense of relief? ARE YOU SEEKING: to lighten up? / to regain your sense of humour or light-heartedness? / to revive your sense of belonging? ARE YOU SEEKING: to feel re-connected to self and others? / to regain receptivity and openness? / to bring yourself back to the present moment? In order to close and complete your workshop experience, take a moment to bring everyone's attention back to the circle, close their eyes, and drop into their heart. Invite participants to silently reflect on one person or moment from their workshop experience that they feel gratitude and appreciation for. As in the beginning, go around the room and have participants express their gratitude and appreciation, ending with you, the workshop leader expressing your heartfelt gratitude. 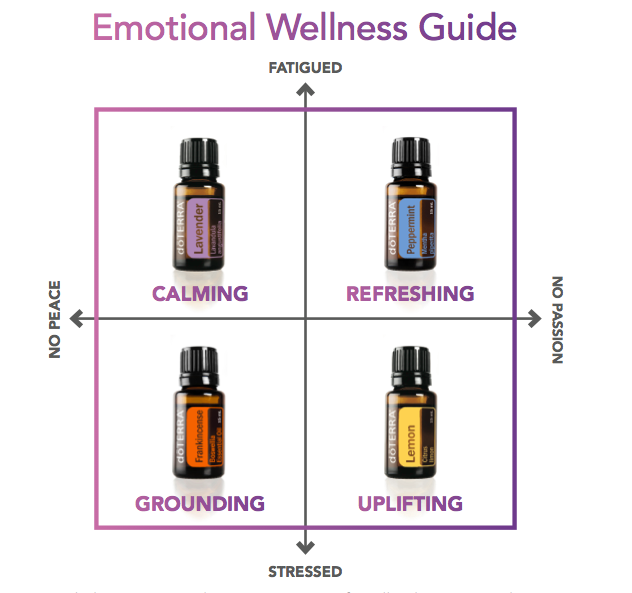 Now that everyone is centred in their heart, remind them that you would like to continue supporting their health and well being with doTERRA. They have the option to join you as a Wholesale Customer to purchase and enjoy the beautiful oils and other products, or they may choose to join our Essential Radiance business building team as a Wellness Advocate. Honestly, I believe the best way to learn about their wellness goals and desires is to follow up individually after the workshop by scheduling a one-on-one phone call or meet up for tea. Spread the LOVE. Easy breezy. It's that simple. I generally charge USD $40 for registration and limit group size (minimum of 5 and maximum of 10) to maintain intimacy and allow for a meaningful experience. This rate and size allows you to replenish supplies easily from one workshop to the next, plus make a profit to invest in your own LRP in the early months of building your business. If you would like additional tips on facilitating this workshop, please reach out to me and I’d be more than happy to share more details. * The highlighted links are intended for Wellness Advocates based in the U.S. and Canada. If you are located in Mexico, the EU, or Australia / New Zealand (or another global market), please contact me directly for sourcing your workshop materials. We'll get you set up for success! *See The MindBody Code by Dr. Mario Martinez, published by Sounds True, to learn more.